The YMCA was home to the world’s first group swimming lesson in 1907. The YMCA has a long history and an excellent reputation for teaching people how to swim. The Maui Family YMCA is no different. 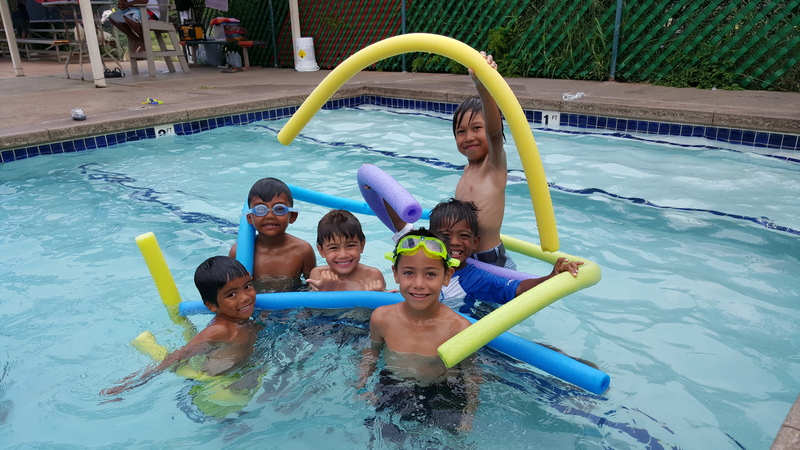 With lap swimming, open and family times, water exercise classes, swimming lessons (group or private) the Maui Family YMCA has everyone’s needs covered. Our YMCA instructors are certified to help any level of swimmer. If you are looking to learn a new stroke or just brush up on the ones you already know, our instructors can help. Students in Pike/Eel are oriented to the aquatics environment and progressively gain skills as they move through the YMCA swim program. At later levels, students build on their basic skills to learn propulsive movements on both the front and back. Personal safety and rescue skills are included to help students meet safety goals. By the end of the fish level, students will have obtained the skills and fitness level necessary for entrance into advanced courses such as swim club or other aquatic activities. Beginners could have a fear of being unfamiliar with how to swim. Their movements will be rudimentary. To progress to the next level they will paddle a length of the pool. Students can already paddle on their front, back, and side. They will be able to paddle across the pool without support and a couple of lengths of the pool with support. Students will be able to perform rudimentary crawl, back, fly, breast, elementary back, and sidestroke. Refinement levels of swimmers begin to look more like our traditional strokes. They are able to swim a couple lengths of the pool without support. Crawl stroke, backstroke, and elementary back stroke will be in good form. The rest of the strokes will improve and show all basic elements. Endurance will be improved and students will also be able to swim two lengths of the pool without support. All traditional strokes have all basic elements. Refinements are becoming mastered. Good endurance will allow swimming 300 continuous yards. All traditional strokes are mastered. Students work on improving efficiency, endurance, and adaptability to unique situations. They work on creative movements in the water. Parent-Child classes provide experiences and activities for parents and infants to feel more comfortable in the water. The child will become aware of the differences between moving through water and on dry land, while the parent will become aware of how to teach his/ her child to be safe in and around the water. Participants will learn how to safely enter and exit the water, as well as how to submerge their faces and explore buoyancy in a front and back position. Parent-child swim lessons require one parent to accompany the child in the water. Keep your child actively swimming with our youth swim club. Swimmers will be trained in conditioning, speed and proper competition strokes. 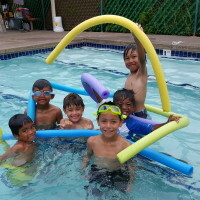 Swim club participants must be at least 5 years old and demonstrate Level 3 (Polliwog) swimming ability. Must be able to swim one lap (50 yards) using front and back crawl. Try a free trial class before joining. A great alternative to a class environment, our private lessons accommodate your busy schedule. All levels are welcome.